At last - a remedy for teeth grinding and jaw clenching! Traditionally, bite splints were used to treat the condition, but these can be uncomfortable, and may fail to address the underlying issue. 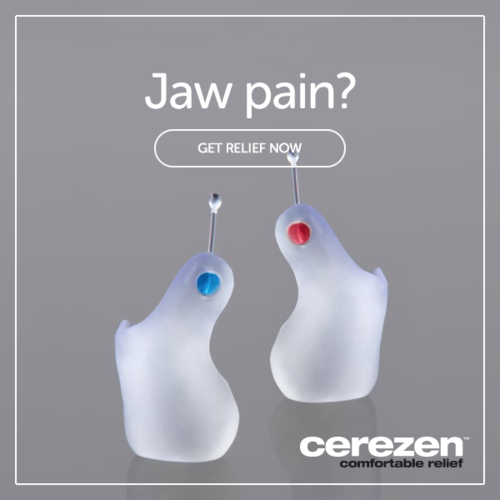 A new treatment, called Cerezen™, is a clinically tested device worn in the ears instead of the mouth, which prevents the symptoms of TMD by retraining the jaw to remain in the 'open bite' position. The inserts, which are practically invisible, can be left in place day or night, except when showering, swimming or playing contact sports. Since they are hollow, they won't interfere with your hearing. Don't suffer from painful TMD any longer - ask us about the Cerezen™ device today and put a smile back on your face!